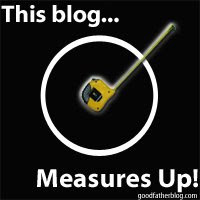 Moments of Mommyhood: This Blog Measures Up! Thanks to my dear friend Vickie! She awarded me with this cool award. I really appreciate your friendship Vickie! 1.Say one nice thing to a man in your life. 2.List at least 6 ways you measure success in your life (or your blog). Raising great kids, having an awesome marriage, being able to continue on through tough times, complete happiness, meeting incredible friends, and being a good friend to others! Tara-she in wonderful! If you haven't been to Kidz, you must visit! Thank you so much! You put a big ol' smile on my face this morning! 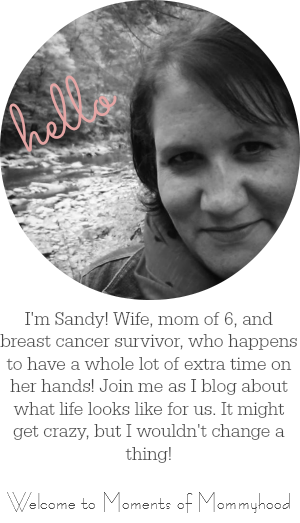 I didn't realize you had another blog...I'll add it to my blog list, if that's alright! Have a monumental Monday!!! Thanks, again! Congrats on your award and thank you for mine! I'm honored!!! Congrats on the bloggy award! You deserve it! Sandy, I'm sooooo behind on my emails. I just barely realized I was honored by you with this fab award. Thank you, thank you! You know I love ya! LOL. Looks like I already came by and thanked you. I guess what really happened is that I forgot. Oye. All I know is that Chloe is causing sleep deprivation and it's not pretty.